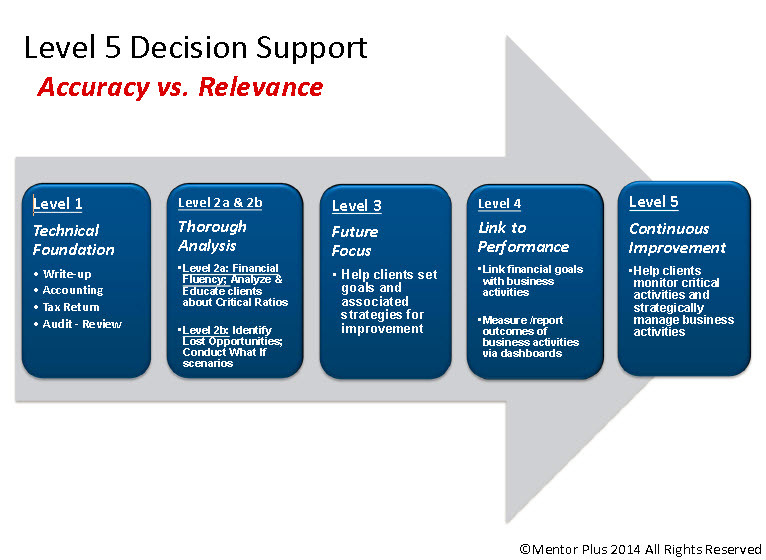 Level 5 Certified Advisor training is now available online. Your ability to help your clients succeed comes down to one thing . . . business acumen; how well you can holistically assess what is really happening in the business as well as provide insight and guidance to improve performance. Being a good accountant provides a strong foundation for being a great business mentor, but it is just the start. The real equation at the heart of all business success isn't measured in Revenue or Expenses; in fact the most important success drivers don't even show up on the financial statements. If you really want to know where the profits are generated (and wait to be exploited) in a business you have to dig deeper to the activity level. The (true) Profit Equation, as we call it, measures activities at the People X Process Level. This is a fundamental shift in the way most business people measure, monitor and manage their business. As a business mentor your job is to teach your clients how to fully leverage both their people and their processes. Learn about the Level 5 Service Framework that is the core of what used to be available only in our live M.B.A. program classes. How to "productize" your advisory services to make them unique, repeatable, and leveragable throughout your firm. You will also gain . . .
How to establish customer focused performance standards and who should be involved in developing them. How to use the $COPE Performance areas and 5 step analytical perspectives to systematize issue Discovery. For over 20 years Mentor Plus has been focused on the well being of small businesses. Rather than work with them one by one (as we did for many years) we chose instead to empower accountants with the knowledge and resources needed to be a great business advisor.